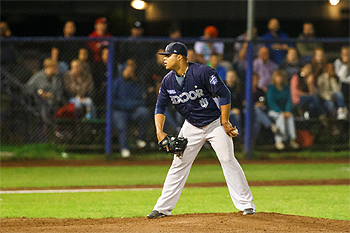 Rare starting pitcher Berry van Driel became winning pitcher for defending champion DOOR Neptunus in Game 5 of Holland Series versus L&D Amsterdam Pirates. Trailing 3-2 Neptunus brings the best of seven series back home in Rotterdam, where they need to win both on Saturday and on Sunday afternoon. In their Familie Stadium, Games 1 and 2 versus Pirates were lost by the home team. In Amsterdam, however, Neptunus managed to halve the 2-0 gap behind Pirates by beating them in Game 3 on Thursday. Marvelous Diegomar Markwell lefthanded a complete game allowing one run only in the ninth inning. On Saturday for a long time Neptunus seemed to berth alongside Pirates, but their relief pitchers could not save the 1-4 score and home batters pushed two runners to home plate in each of the last two innings. Instead of star pitcher Rob Cordemans, it was Pirates closer Chris Mowday to book the pitcher’s win. Holland Series at 3-1 for challenger L&D. With L&D Amsterdam at championship point in Game 5 on Sunday, national broadcaster NOS send four TV cameras to Ookmeer Sportpark for live reporting through channel Nederland 1 to Dutch living rooms. Viewers at home and fans in Ookmeer saw another game reach a 1-4 score after seven innings, but this time starter Van Driel and closer Kevin Kelly shared the last two innings successfully.